My recent efforts at creating a small Bird Sanctuary on my property has brought back all types of memories and internal debates within myself. How far do I get involved with the “Wildlife”? There is definitely a line. Many years ago when I was writing up the first Hiking Michigan Park Trails MAPBOOK I had a very tuff decision to make. For one Spring and Summer, I headed out to the same Pine tree stand, overlooking a Meadow in a private area of Stony Creek Nature Study. I would go to this spot almost every day to write and edit. So did a Mama Doe and her two new Fawns. They quickly became used to my presence there, and MaMa would let the youngsters frolic pretty close to me. She even grazed pretty close to me, almost saying……”It’s OK, just don’t hurt my youngsters”. This went on for the entire season. It got so normal, that the youngsters would kinda run in my direction as I would approach my normal sitting spot under the Pines, on the hilltop. Winter came and I left to publish the MAPBOOK. The follow Spring, I selected a spot, deep in the Forest nearby, and started a second Book. As I sat there one day, I suddenly heard the snap of a twig near me. It was a young Deer approaching directly to me. I actually recognized this deer. It was one of the youngsters I had spent the previous summer with. He had distinctive markings that made his identification easy to be sure of. As he approached, I could see he was not afraid of me, his tail was wagging vigorously, and I swear he was smiling. 🙂 There was no question in my mind, that he recognized me, and that was the reason he was coming in. I had to think quickly. Do I make a friend of a wild critter, thus putting his life in jeopardy, should he approach another human that was not his friend? Do I teach him that hanging out with humans is OK? I threw my arms in the air and yelled. The deer stopped for a moment and then continued toward me. I yelled further and started to walk towards him. He turned a slowly trotted away. As he got only a few yards away, he turned to look back at me…..tail still wagging, and then slowly walked off.It was one of the hardest moments I have had in the Outdoors. I would love to have made a permanent friend of this deer. BUT……I know for sure it would have jeopardized his length of life. I still can see this scene in my head, like it happened yesterday. Recently, with all the effort I had put into the Home bird sanctuary, I have once again come to face the tuff question of……”Where does the Wildlife fit, into my understanding of the Natural world”. I have become very protective of all my new Bird friends. I get angry at the Hawks that swoop in and take them away. I cringe when I hear the scream of one of the small Song birds, as a Hawk dive-bombs them even while hidden in a bush. I once again face a dilemma that I thought I had finished with, many years ago. I understand the Outdoors well. I know there is death for there to be life. I know this is the balance of Nature. The strong and clever survive, to give birth to the next generation. As it should be. The new HIKES SCHEDULE for 2011 is out. Our first Hike is a special one, with all in attendance receiving a free copy of our Hiking Mapbook, :HIKING S.E. MICHIGAN”. The book has 11 detailed park maps to help guide you deeper into the forests and beautiful places in our local State and Metro Parks. 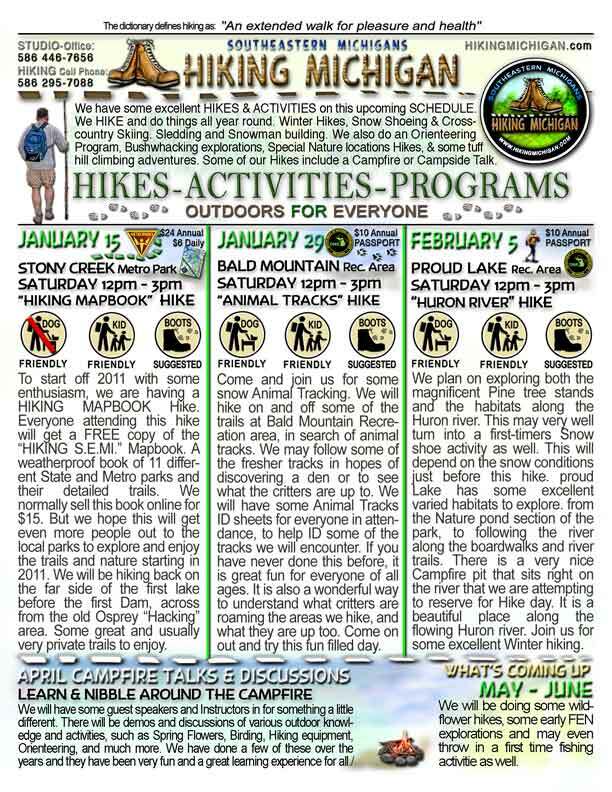 We hope you will join us for some of our Hikes in 2011. We always have a great times, and of course EVERYONE is welcome here. See you all out on the trails.